All airports create special safety problems and are major polluters, but the Toronto Island Airport has proven to be a disaster. The airport is within two kilometres of the commercial heart of the city. Hundreds of thousands of people live within a short distance and thousands more are coming to live in the condos that are being built along the waterfront, the railway lands and the central core of the city. The island airport dumps its pollution on more people than any other airport in the country. The safety hazards from a combination of short runways and tall buildings are multiplying. 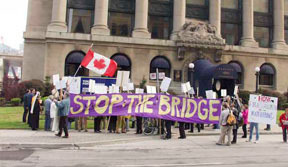 Community Air members demonstrating to stop the bridge in front of the Harbour Commissioner’s building, the headquarters of the Toronto Port Authority. If the island airport expansion is allowed to continue, the airport will play a major role in the destruction of a major natural habitat for wildlife in the city. A bird sanctuary exists less than one hundred metres from the longest airport runway. Several species of waterfowl make their homes along the shores. Fish abound in the waters. Turtles and frogs live in the island lagoons. Foxes, beavers, muskrats and raccoons are in abundance. The greatest gifts to Torontonians from the generations before us are the quality of life of the residents and the natural habitat of the islands, the lake, the harbour and the waterfront. The island airport expansion is a threat to those gifts, and yet some politicians and parts of the business elite have encouraged airport expansion against the wishes of the majority of people of the city. Commercial aircraft are allocated 202 slots, or take-offs and landings, every day. Thirty of those slots are held by Air Canada and the rest are held by Porter. This means there are on average one aircraft movement every 4.6 minutes during operating hours. During the peak hours of the morning and evening there are about one take-off or landing every minute. Noise from the aircraft is a huge problem particularly for the people living in Bathurst Quay neighbourhood. Take-offs and landings cause much of the noise, but engine run-ups, when the engines of the planes are run for several minutes at high revs to check for safety problems, is a particular annoyance. The run-ups happen at any time of the day or night. Traffic has become a special problem for the people of Bathurst Quay. Eirann Quay is the main roadway going to the passenger drop-off and pick-up. Children and adults have to cross this busy street to get to school and Harbourfront Community Centre. Cars and taxis rush down this street causing a huge hazard. Parents of small children have protested and picketed but little has been done to calm the traffic. The Toronto Port Authority is resisting putting in speed bumps to calm traffic. Billions of public- and private-sector dollars are being invested on the waterfront. One hundred thousand people will live on the waterfront and another 100,000 will work there when the project is completed. A busy airport with hundreds of daily flights is incompatible with redevelopment. The film industry is clustered in the Port Lands at the eastern end of the harbour. The constant flights overhead is a huge problem for film makers because they destroy the sound quality of the film. The island airport is an unsafe, inadequate facility. The runways are too short, the stopways are inadequate, bird strikes are common, and “pilot cautions” list several hazards from high rise buildings and smoke stacks around the airport. Short-haul flights cause more pollution than any other form of travel. A flight from Toronto to Ottawa by a Porter Q400 releases 2,865 kilograms of CO2. Car traffic generated by the airport is bringing more air pollution to the nearby neighbourhoods. Bathurst Quay and along Queen’s Quay west of Spadina is one of the most polluted areas of the city. Millions of dollars of government subsidies have gone to Bombardier, the Toronto Port Authority and the island airport. Porter Airlines has received $20 million from the federal government. Why are the taxpayers subsidizing a polluting airport and private companies? High-speed trains must replace short haul flights along the Toronto/Ottawa/Montreal/Quebec City corridor and to other major centers. This will reduce air pollution, eliminate safety problems and move people efficiently. Porter Airlines should relocate to an airport where it can adequately serve its customers and reduce pollution in the high-density downtown neighbourhoods. Lands currently used by the airport should then be turned over to more environmentally friendly purposes. The 215 acres of land occupied by the island airport provide a unique opportunity to create exciting parks and public facilities accessible to millions of people. On April 9, 2013 Porter announced an ambitious expansion plan to allow jets at the Island Airport, Increase the length of the runways by 1,102 feet, fill part of the harbour and Lake Ontario, increase the number of take-offs and landings and the number of passengers using the airport. This is a quantum leap in the size of the Island Airport and will increase the impact of the airport on the Waterfront and the city.